What are the classes like at Global School of English? We are often asked what it’s like when you come to study at Global School of English. The easier way is to show you, which is why this year we’ll be creating more videos for you to look at. This is a great one, showing Rhiannon teaching an intermediate class about the correct use of the Past Simple Tense. If you read our last article, then you’ll know that the Scottish kilt, the “skirt” that is worn as part of “Highland Dress” is actually the invention of an Englishman! Don’t tell Scottie – our Schools’ mascot! However, we did promise that we’d tell you a bit more about Scottie’s kilt and, in particular, about his bagpipes. Scottie’s kilt is made of one of the most famous and best-known tartans, called Royal Stewart. However, there are, literally, hundreds, if not thousands, of other tartans. Mostly, they are associated with a Clan (a family grouping) and referred to by the surname of the Clan, such as the Stewarts, MacDonalds or Campbells. Tartan cloth is now famous worldwide and often used in the fashion industry to make attractive clothes (not just kilts but trousers, jackets and other things) for both men and women. Here are some examples of tartans. From the left, they are: MacLeod, Royal Stewart and Black Watch. The Black Watch is a very famous Scottish army regiment. All the Scottish regiments wear kilts in their own, often very distinctive, tartans. Another thing that amazes many people about the kilt is just how much material is required to make one. If you look at the kilt more closely, you can see that the material is pleated, which means it is folded together so that the cloth forms ‘pleats’ which overlap each other. This means there is a lot of cloth used: eight yards (over seven metres) for each kilt. This makes the kilt very heavy to wear. The cloth is made from wool, woven into the tartan patterns. As well as wearing his kilt, Scottie loves playing the bagpipes. There are many different forms of bagpipes all over the world, from Malta to India, but the Highland bagpipe is probably the largest and best known. If you come to study with us here in Scotland, in either our Glasgow or Edinburgh Schools, you’ll often hear and see bagpipers playing in the streets for the tourists (especially in Edinburgh). 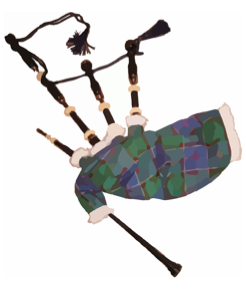 The bagpipes consist of a bag, traditionally of leather but now often of artificial material, with three long ‘drones’ that come out of the top of the bag and make the background ‘droning’ sound; a ‘chanter’, which is the stick that hangs below the bag and on which the notes are played; and a ‘blowstick’, which is in front of the drones and is for blowing air into the bag. 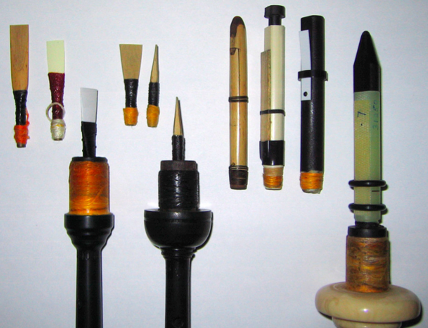 By keeping the air in the bag at a constant pressure (by a mixture of blowing into the bag and squeezing the bag with the left arm), the piper is able to regulate the pressure of wind passing over the reeds in the drones and chanter and these are what create the noise – the droning background from the drones and the actual notes from the chanter. The picture below shows a selection of reeds: the ones on the left are for the chanter and the ones on the right are for the drones. There are only thirteen notes on the chanter, from C to a high A, but from these thirteen come some memorable and stirring music, which often shows the origins of the Highland bagpipe as a instrument used in battle. Interestingly, until 1996, the Highland bagpipe was legally regarded as an instrument of war in the UK – a weapon in other words. This was because the Highlanders were often led into battle by a bagpiper. There are many famous stories of very brave pipers leading soldiers into battle, one of whom won the Victoria Cross – Great Britain’s highest award for bravery – as a result of his actions. You can read more about the bagpipes’ military role at this link. 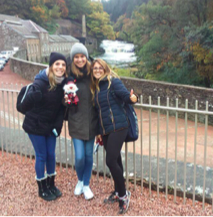 We’re not sure if Scottie is brave enough to win any medals, but we do know that he’s very popular with our students, who often take him with them on their trips to see popular landmarks, museums and buildings in Scotland. What have the Scots done for us (or why should you come to Scotland to learn English)? It is argued, and not just by the Scots, that Scotland has made a greater contribution to the modern world than almost any other country. However, many study travel agents tell us, that, for example, the vast majority of people in many different countries don’t know much about Scotland. Yet everyone in the world knows what a television is, and television was invented by a Scot (John Logie Baird). Similarly, many people live in cities full of people who travel by bicycle, which was again invented by a Scot (Kirkpatrick McMillan). And virtually everyone in every country regularly uses a telephone, also invented by a Scot (Alexander Graham Bell). Where would the world be without the Scots? Would there have been an Industrial Revolution? Arguably the most important person in that revolution was Scot James Watt, who pioneered and improved the steam engine that powered Britain to become the ‘Workshop of the World’ in the 19th century. How would we be able to drive along modern roads, or land on the ‘tarmac’ at airports across the world, if it hadn’t been invented by John McAdam, the Scottish engineer from whom tarmacadam takes its name? Not to mention (although we just have) the modern rubber tyre (invented by a Scot, John Dunlop) upon which all cars (and airplanes when they land!) keep in contact with the tarmac road surface! We all know James Bond, the most famous fictional spy in the world. And the actor who is most associated with the role is Sir Sean Connery, born in Edinburgh, as was Sir Arthur Conan Doyle, author and creator of the world’s most famous fictional detective, Sherlock Holmes (there is a statue of Doyle in the street where he was born, not far from where we have our Global School of English). We could go on and on. The toaster, penicillin, the electric clock and the fax machine, neo-classical economics, the American Navy, logarithms, beta-blockers, the steam-boat, the adhesive postage stamp, the thermos flask, even the Bank of England – all these and many more were invented/founded by a Scot. So the next time a student asks where they should go to study English, why not suggest they set off on a voyage of discovery to Scotland! It’s a subject of great interest to many of the students who come to study with us here in Scotland why some Scotsmen wear what appears to be a woman’s skirt or dress. In most of Europe and North America only women wear skirts. However, in Africa, India and indeed parts of Europe and Asia, male “skirts”, in the form of a length of material, sometimes called a sarong, a veshti or mundu, are often worn. So why do we do it here? The history of the kilt in Scotland goes back to the seventeenth century at least. Originally, it was a much bigger garment than the modern kilt. This “great kilt” was also called a “plaid”, and consisted of a large, woollen cloak which could be wrapped around the body. It was worn mainly in the Highlands – the northern, mountainous part of Scotland. Nowadays, everyone associates the kilt with tartan cloth, with each different tartan identified with a family or “Clan”. However, in the earlier centuries different patterns (tartans) of cloth were associated with a region, not a Clan or family grouping. These ancient tartans were not really like the modern, more colourful tartans (like the one on Scottie’s kilt), which are a much more recent invention. In the late eighteenth and early nineteenth centuries, the modern, shorter kilt evolved from the “great kilt”. Many people are surprised to discover that the modern kilt was invented by an Englishman, not a Scotsman! His name was Thomas Rawlinson and he came up with the idea of a shorter kilt in 1728 when he was living and working near Inverness. This new kilt was much easier to work in and soon became popular. The Scots who lived in the lowland areas of the country began to wear the ‘short’ kilt and in the nineteenth century Queen Victoria, who loved coming to Scotland, helped make it even more popular by dressing her sons in it when they came to stay at Balmoral Castle in Aberdeenshire in the summer. It was also in the nineteenth century that modern tartans – and their association with different Clans – began. Many people refer to this as the “Balmoralisation” of tartans, because the British royal family was very keen on Scottish culture and when they came to Balmoral Castle encouraged the wearing of “Highland Dress” amongst the Scottish gentry (the rich men who owned most of the land) and their families. We’re not sure if Scottie is a member of the gentry or not, but he does look very smart in his kilt! If you haven’t been to Scotland before, it’s important to tell you that we don’t wear kilts all the time (unless we’re playing the bagpipes! ), but when you do come to study in Scotland, with any of our three Schools of English, you will see people wearing kilts and also hear the bagpipes. We’ll tell you a bit more about Scottie’s kilt, and about his bagpipes, in our next article. From Brazil to Belgium, our English language students all have one thing in common! Matheus Barros and Elisabeth Dewulf (pictured here with Scottie, the School mascot) come from two very different countries. Matheus is from Brazil, specifically the north of Brazil (where he says there are two seasons – summer and summer! ), while Elisabeth is from Belgium. They also have very different backgrounds: Matheus has a degree in music and is involved in teaching music, while Elisabeth is a law graduate, with a Masters from Louvain La Neuve, who, after her course at Global School of English, is going on to a legal internship with the National Trust of Scotland. They were amongst the friendliest, nicest students we’ve met (and they are all pretty good!) so it was a real pleasure to chat with them about Scotland, Edinburgh and Global School. Both of them ‘found’ the School on Google, while exploring possible places to study. Elisabeth said she specifically searched for Edinburgh because she wanted to come here and not London, while Matheus had already been to Scotland (and London) five years ago, travelling with other musicians and playing in churches and other venues across the country. Both Elisabeth and Matheus have travelled around Scotland during their time with Global School. Elisabeth has visited St Andrews (the home of golf), Perth (and nearby Scone Palace, close to the site where Scottish kings were crowned many centuries ago), but she really likes Edinburgh. She confessed that when she was younger she read all the Harry Potter books so it was great to go and see the café where J K Rowling began to write these stories! Elisabeth, like Matheus, enjoys music, playing the flute and singing when she was younger, and she also was a keen fencer (sword-fighter) at school but is now an enthusiastic hockey player. Matheus, as you would expect, is really into his music and enjoys the blues, samba and R’n’B. Being Brazilian, he has to like football, but he says that he prefers cycling for exercise. Overall, both would really recommend Global School of English. If you are looking for a very friendly place to learn English, then why not come to Edinburgh and find out just why Elisabeth and Matheus enjoyed themselves so much here?